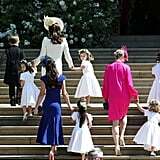 As you might recall, Pippa Middleton garnered quite the following after she acted as bridesmaid to her sister, Kate, during the 2011 royal wedding. 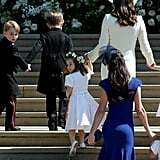 But it wasn't just because the then-27-year-old was glowing with pride or carefully lifting the train on Kate's Alexander McQueen gown. To be frank, it was because her booty looked damn good in the button-backed, cap-sleeved dress she was wearing, also by Sarah Burton for McQueen. 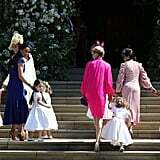 And now that we've admired all the guests at Meghan Markle and Prince Harry's wedding, we can safely say we've found our new Pippa. 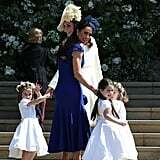 Jessica Mulroney, Meghan's stylist and BFF, slipped into a cobalt blue dress from Canadian label Di Carlo Couture. 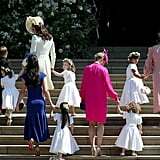 The £1,110 piece, though brighter in shade, boasted plenty of similar details to Pippa's signature look. 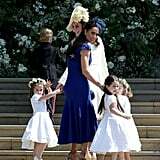 As Jessica walked Meghan's pageboys upstairs so they could assist her with her lovely Givenchy dress, onlookers noticed her, ahem, derrière, and needless to say, Jessica's outfit, complete with Christian Louboutin pumps and a navy fascinator, became something to gush over. Read on for comparison shots and to see how the formfitting yet elegant numbers flattered Pippa and Jessica from all angles, then shop Jessica's exact piece.